After our 5 day canoe tour in south Sweden we were quite ready to experience another big city. We drove from Bolmen to Malmo. What a surprise to me? A Bridge connecting two countries… yes it was expensive, 80 Euros to take the bridge from Malmo to Copenhagen.. but this is amazing…. The feeling of crossing from one country to another via a bridge fascinated me…..
We arrived towards 12 noon in the city of Copenhagen and decided to park in the city camping. Was quite centrally located and we could take a boat to the city centre. We knew what we wanted to do that evening.. a nice walk in the old town and have dinner at the restaurant Kasper recommended to us. Det Lille Apotek.. 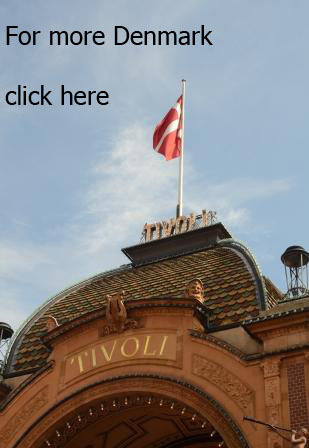 It is an authentic Danish restaurant, very centrally situation. We did not want to miss the chance of having no table, so we went there early on in the evening and booked a table for 2 for the night. 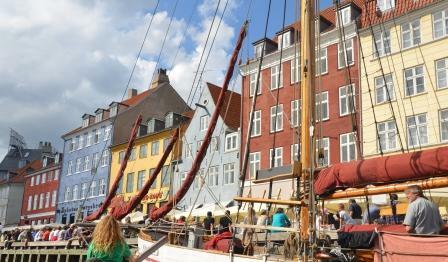 After cruising in the old town, we had a lovely Danish dinner. The next day we did a full canal cruise to visit all the famous places in Copenhagen: harbor, fortress, little mermaid, etc. In the evening we drove to Roskilde. Gerhard wanted to visit the Viking ship museum in the morning. We spent the night in the parking of the museum and went to see the cathedral in the night. So the next morning, we were the first to enter the museum. A great place which talk a lot about the history of Vikings and their ships. It was fascinating to see how they rebuild old Viking ship models… a great way to relive the old age…. In the afternoon we drove towards Hamburg, the last stop of our journey….